Which flatbed can print lenticular pictures? See here. Are you looking for a cost-effective print solution for a limited number of small lenticular prints, or a series of large prints that wouldn’t fit on a litho press? Make sure to take a look at flatbed printing. Recent developments in the large format and flatbed printing market have led to tremendous quality improvements. This evolution makes flatbed/inkjet very suited for lenticular printing. The key points are the higher resolution capabilities and the smaller drop size of the latest generation flatbed printers. This development combined with the versatility of fast drying UV inks makes direct-to-lens flatbed lenticular printing an interesting option for many projects. Our European produced large format sheets 3D 28 LPI UV-MF™, Motion 20 LPI UV-LF™ & 3D 20 LPI UV-LF™ were specially designed for flatbed printing. 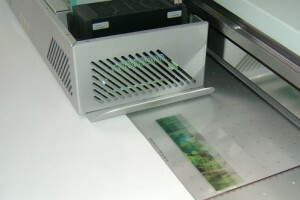 Which lenticular sheets can be printed on a flatbed printer? It will depend of the printer (resolution, drop size, …). But also, like always in lenticular, it will depend of the effect, the viewing distance and the image size. As we explain on this page. You can also check the depth calculator for a 3D image. The choice won’t come from your lenticular software… of course, experience will help. Don’t hesitate to ask us, we’ll be happy to help you choosing the best lenticular sheet for your project.